Welcome to an ongoing series by The EvoLLLution’s Managing Editor, Amrit Ahluwalia. His articles will recap content published on The EvoLLLution, providing postsecondary leaders with some wider visibility on what’s happening in the fast-changing world of higher education. Today’s students think and act like customers. This shift in their perspective requires postsecondary leaders to begin acting as if they work in organizations that need to serve customers… rather than as gatekeepers of knowledge whose students are fortunate to have received admittance. The fact is that if colleges and universities deliver a high-quality customer experience, they’re more likely to attract and retain greater numbers of students. These expectations aren’t specific to any one industry—they’re the standards applied across the board. Unfortunately, most colleges and universities miss the mark delivering on them. “Students are used to the convenience of a click or swipe, and they’ve built this expectation into all aspects of how they use the internet, including for the purposes of higher education,” said Lisa Slavin—Assistant Vice President of Enrollment Management at MassBay Community College—in a recent interview on The EvoLLLution. So let’s dive into these elements of the “Amazon Experience” and explore how hitting these marks can make an observable difference for postsecondary institutions. It’s absolutely essential to think of modern students like customers. First, students today don’t have time to navigate red tape. After three bad experiences with administrative bureaucracy, a modern student is likely to drop out of their course or program. Second, just because students have high expectations of the experience being delivered outside the classroom doesn’t mean they expect a less rigorous experience inside the classroom. In fact, most students enroll to achieve a specific set of outcomes or competencies that directly impact their career prospects. Watering down the academic product makes higher ed not worth the cost of admission. “To be clear, ‘students as customers’ does not mean that the customer is always right. We are still educational institutions, of course, and we have policies and processes in place to protect academic integrity, student privacy, and governing financial regulations. The first aspect of delivering a modern customer experience to students is making it convenient. Customers expect to be able to find whatever information they need, or to conduct whatever process they must, whenever they want and wherever they are. What’s more, customers in any industry are likely to abandon a purchase if they can’t understand your site or if the steps they have to take to become a customer are convoluted. According to the Baymard Institute, 27% of eCommerce shoppers abandon their cart without making a purchase because the checkout process was too long and complicated. By taking simple steps to provide students all the information they need up-front—including what’s involved in a given course and how it could fit into their education journey—postsecondary institutions can make a huge difference in simplifying the registration and enrollment experience for learners. This, in turn, leads to an improved customer experience. Another element eCommerce leaders have made standard practice is providing customers self-service tools. Whether it’s booking a flight, making a purchase, or processing a return online, companies make it simple and easy for their customers to manage the majority of their own experience. That self-service starts with a virtual shopping cart that is easy to use and that is also optimized to address the common behaviors of the modern consumer. Specifically, cart abandonment is a huge issue in the eCommerce world—69.9% of customers are likely to abandon their cart before completing a purchase—which means postsecondary institutions need to defend against the chances that a prospect might add a number of items to their cart but leave before completing the purchase. What’s more, students want to be able to enroll, pay or even apply on their own time. In the modern eCommerce environment, customers have access to a huge amount of information about their purchase in real-time—including order status and in many cases shipping progress—and they’re expecting the same from higher education as well. Allowing students to manage the more bureaucratic elements of their student experience—downloading transcripts, printing receipts, making payments, adding/dropping courses, etc—provides students with a sense of control while freeing up staff time to focus on more high-value work. This isn’t a pipe dream—this is measurable and provable. Destiny Solutions has worked to adopt and deliver eCommerce best practices and, over one financial quarter of internal study, noticed some staggering results among its client schools. 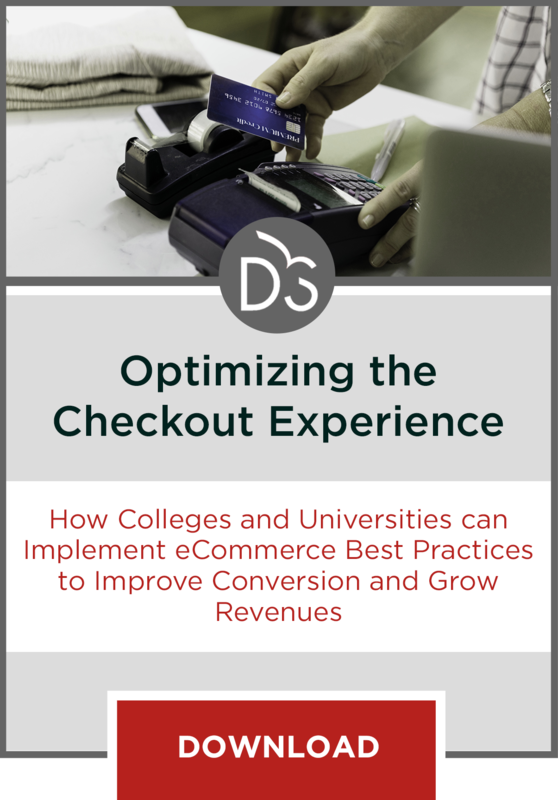 You can read more about it in their white paper Optimizing the Checkout Experience to Convert More Prospects into Students, but I’ll spill some of the beans on the major findings here. By making a few significant changes to the shopping experience—including improving the design of the shopping cart, streamlining the registration process, and automating abandoned cart recovery—Destiny solved for the six main reasons why eCommerce shoppers abandon their carts. As a result, according to internal studies operating one quarter of the financial year, Destiny found that 9% of learners recovered their otherwise abandoned carts when prompted. This led to an average 11% increase in revenue for Destiny One institutions over that one quarter, which equated to just under $40K in revenue (on average) in three months… more than many schools pay to run Destiny One over an entire year! What’s more, the improvements to the site design meant that the abandoned shopping cart rate for Destiny One client schools was a mere 44%—well below the eCommerce industry average of 69.9%. For a modern college or university—or at least one that wants to stay relevant over the long term—treating students like customers is critical to future success and growth. Of course, that means being student-centric and customer-focused at every level of the institution. You cannot deliver an Amazon-like front-end experience without an Amazon-like back-end. That has to be the starting point of any conversation around delivering on the expectations of a modern postsecondary customer.